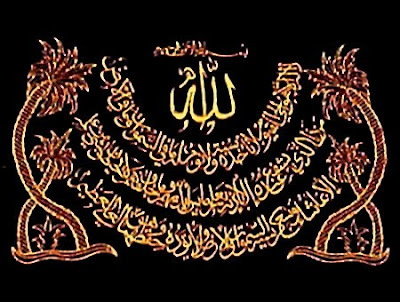 Ayat Al-Kursi, The Throne Verse (Arabic: آية الكرسي ‎ ʾāyatu-l-kursī), is 255th verse (ayah) of the second chapter Al-Baqara (The Cow). Ayat Al-Kursi is one of the most famous verses of the Qur'an and is widely memorized and displayed in the Islamic world due to its emphatic description of God's qualities and power. Traditional belief holds that anyone who recites the verse enters the protection and security of God. Commonly, it is recited by Muslims before they go to sleep, before travelling on a long distance, or in a state of fear and worry. Do you know the Ayatul Kursi?" Anas (radiAllahu anhu) replied "I know". 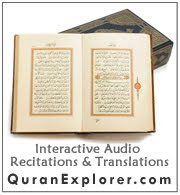 The Prophet (Sallallahu alayhi wasallam) said, "It is equal to a quarter of the Qur'an"
Allah! There is no god but He - the Living, The Self-subsisting, Eternal. He knows what happens to them (His creatures) in this world, and what will happen to them in the Hereafter . and He feels no fatigue in guarding and preserving them. And He is the Most High, The Supreme (in glory).